This page will give you an introduction to selecting a spinning wheel, buying a spinning wheel, touching on the types of wheels, technical terms, attachments, spinning options and considerations in choosing a wheel, including, perhaps, your first wheel. L - Distaff This picture will give you an idea of the parts of a typical wheel. Not all wheels look like this but all have similar parts that do the same thing. This is a double drive set-up; a Scotch tension wheel would have one drive band loop and perhaps a different type of tension screw. The drawing is taken with permission from a good little book by Bette Hochberg, "Handspinner's Handbook." This and other books by Hochberg and others can be found on our book page. You may find reading about spinning will give you additional background for making the correct selection. You might hear a number of opinions on this but we think a clearing of your "mindset" will allow you to understand that this should not be an issue for anyone. Height - our view is this: it does not matter one bit if you are using a wheel that has a round orifice (not a delta style which you will find on Majacraft wheels). The round orifice allows the spinner to have the yarn approach the opening of the orifice at any angle. This can be straight into the orifice, or any angle up to a 90 degree turn of the yarn as it enters the orifice (not a likely angle, but it works). So if you can imagine holding the hand that controls the twist at an extreme location (for example, at 12, 3, 6, or 9 around the "orifice" clock), you will find that it works. A normal, comfortable angle is somewhere in a "cone area" out in front of the orifice. Spinning takes place at your hand, not in or at the orifice. So locate your "spinning hands" anywhere you like that is comfortable - in front of you, to the left or right; any where. Your hands do not need to be near the orifice when spinning and we would even encourage you to keep your hands away from the orifice as this will tend to have you sit too close to the wheel or to bend over as you spin. Sit back and get comfortable in the position that makes it easy for you to treadle. Now that you are in a comfortable position for spinning - spin. If your hands are 6" to 12" or 18" from the orifice, that is OK. If your hands are left, right, above or below the orifice, that is OK As you see, the height of the orifice is not important (if you feel a need to have your hands just in front of the orifice, you need to correct this). With your hands in a comfortable position, let the yarn go to the orifice at any angle that results. Consequently, height of the orifice is not important. If you ride a bike, you know the advantage of gears. You change gears depending on the conditions. The same can be said for spinning. Ratios are important in spinning because you can control how quickly twist develops in your yarn - mechanically. Having a wheel with several speeds or ratios allows the spinner to increase or decrease twist rate without changing the normal treadling cadence. Different fibers require different amounts of twist during spinning and a wheel with a good ratio range makes this easier. Generally, fine fibers such as Merino wool and angora, or short fibers such as cotton require the faster speeds. Coarse fibers, such as Romney or Border Leicester use a slower speed. Ratios up to 10 or so we would call a slow wheel; ratios up to 14 or so would be a mid-range wheel; and high-end ratios of 16 up to 20:1 would be considered a fast wheel. The low to high speed range of a particular wheel gives you flexibility. Speeds above 20:1 are used in only a few applications. To change the speed/ratio you normally just move the drive band from one whorl (pulley) to another. Some wheels require you to change the whorl. Get a wheel with a good overall range of ratios and you give yourself options. Normally, most wheels will offer 3 or more ratios as standard. Options of adding slower or faster whorls on a wheel (double drive design) or adding other flyers (single drive wheels) can give you the ratios you need. Can you spin yarn with high twist on a slow wheel? Yes, but several factors come into play. On any wheel, even very slow wheels, if you do not allow the yarn to accumulate on the bobbin, you will develop more and more twist. If you treadle a slow wheel very fast, twist will develop faster. So on a slow wheel you can get a lot of twist in your yarn but you will need to do one or more of the following: treadle faster, hold the yarn in your hand longer before it goes into the orifice, use the fastest ratio, or any combination of the three. A better solution is to consider a wheel with better, high-end ratios. Ask different spinners and you will get different opinions on which is best, so let's start with the difference. A single drive wheel has the drive band going once around the wheel and the flyer and has a separate brake on the bobbin or flyer. This is also known as the Scotch tension braking system. A double drive wheel uses a drive band that is longer, as it goes around the wheel, to the bobbin, back around the wheel again then around a whorl on the flyer. Some wheels come one way, others the other way, sometimes you can get both (kind of...). Sometimes you get to choose (Ashford Traveller and Traditional). So what is the big deal? Most beginners will find the Scotch tension system easier to understand and master. Both the brake and the drive band can be adjusted separately so control of twist and take-up are easier. The double drive system provides a firmer, more consistent yarn and with normally higher ratio options. If the wheel you like is a double drive wheel, see if it comes with a Scotch tension single drive option; this gives you freedom to use both. Single drive wheels have the drive band going around the wheel one time. The drive band will then go around the drive pulley on the flyer or the bobbin. Flyer Lead (Scotch Tension) Ashford, Lendrum, Majacraft and Kromski Prelude drive the flyer. The rotation of the wheel causes the flyer to rotate and depending on the difference between the diameter of the wheel and the diameter of the flyer pulleys, you develop a ratio between the two. A brake band (sometimes called Scotch tension) with a spring attached, is placed over a pulley built into the bobbin , and the tension is adjusted. This information applies to nearly all single drive spinning wheels built today, regardless of brand. Bobbin Lead (Irish Tension) Some manufacturers have the drive band drive the bobbin, not the flyer. The wheel drives the bobbin and the brake is on the flyer. Double drive wheels also use one drive band but it goes around the wheel twice (you make a double loop of the drive band to do this). At the flyer, the two loops of the drive band do two different things: one of the loops will go around the whorl (the whorl will have one or two grooves of different diameters - your ratios are established here with the whorl. Whorls are located at the rear of the flyer and are removable so you can change the ratio of the drive; the whorl must be removed to change the bobbin); the other loop will go around a pulley located at the end of the bobbin. This information applies to nearly all double drive spinning wheels built today, regardless of brand. Spinning takes place in the following manner: the main wheel drives (rotates) the flyer/bobbin by means of the drive band. Tension on the drive band is adjustable and you set it to make sure there is no slip at the flyer/bobbin. 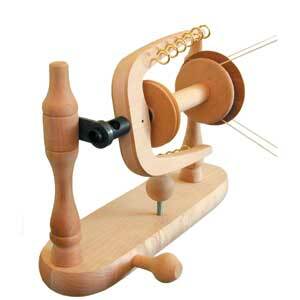 You treadle, the wheel turns, the flyer and bobbin rotates) and twist is imparted to the fibers in your hand. In order for the yarn to get on the bobbin automatically, there must be, from time to time, a change in the speed of the bobbin. It must: slow down (be braked) on single drive wheels; speed up on double drive wheels - so the flyer can facilitate wrapping the yarn around the bobbin. This is where the two methods diverge. A single drive wheel has a separate dedicated band, a brake band (Scotch tension), around the bobbin or flyer . In order to facilitate the accumulation of yarn on the bobbin, the bobbin or flyer is "braked," or retarded, when: 1 - you have the proper tension on the brake band; 2 - you allow the twisted yarn in your hand to be pulled into the orifice of the flyer (the "take up"). On a single drive wheel, you have a way to adjust tension on the drive band (not really needed if using an elastic band) and a separate adjustment for the brake band/take-up control; adding tension to the brake increases the pulling force of the yarn from your hand. 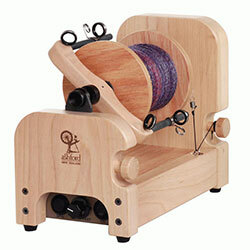 Ideally, you want a gentle pull that quickly gets the yarn on the bobbin. On a double drive wheel, there is no separate brake band but rather one of the loops of the drive band will cause the bobbin to rotate while also slipping during spinning while the other loop drives the flyer. The shape of the whorl grooves (V-shaped) results in positive drive of the flyer all the time while a different shape of the groove on the bobbin pulley (U-shaped) allows "slippage" of the bobbin while you add twist to your fiber. While spinning, the bobbin slips on the drive band to allow the bobbin to rotate in sync with the flyer. When you allow the yarn to be pulled into the orifice you are letting the bobbin gain speed (less slipping) in relationship to the flyer arms causing yarn to be wrapped on the bobbin. This all works if: 1- your tension is set correctly; 2 - you allow the twisted yarn in your hand to be pulled into the orifice of the flyer. The tension adjustment affects both the drive of the flyer and the slipping of the bobbin, so one adjustment must result in good performance of drive and take-up. This is not difficult to do. Also note that for a double drive flyer to effect take-up the pulley on the bobbin must be smaller than the whorl. Never match a small whorl with a bobbin pulley that is larger. Many double drive wheels allow you to adjust the set-up to mimic a single drive operation (a brake band (Scotch tension) on the bobbin, drive band on the whorl) and this works very well, but it is still a double drive wheel because the flyer, bobbin and whorl are manufactured that way. It is easy to go back and forth with these different set-ups on a double drive wheel. Most wheels are made either single drive or double drive. Only the Ashford Traditional and Traveller are available as true single drive wheels or true double drive wheels (based on the manner of construction). For these Ashford wheels we always recommend the single drive set-up. If you have a double drive spinning wheel, you can make some adjustments that might make tensioning of the drive bands and control of the take-up easier and more like a single drive wheel. Use two different types of drive bands as single loops. For the drive of the flyer, use an elastic drive band. An elastic band will provide positive drive with minimal tension (easier treadling). Use a traditional string drive band (cotton, hemp, etc.) from the wheel to the bobbin pulley. Remember, for this set-up you want the flyer to rotate without slippage, but for the take-up of yarn, you need braking at the bobbin. This set-up gives you both. To control take-up, move your mother-of-all in the usual manner to achieve the feel you want. Since the flyer drive is using an elastic band, any movement of the mother-of-all (to control take-up) has virtually no effect on the positive rotation of the flyer. Now, in a sense, you only have to adjust the take-up; the flyer tension takes care of itself. Watch this Very Helpful Video! How to set the drive band tension on a single drive wheel that has an elastic band. In order to take full advantage of an elastic drive band on a single drive wheel, you want to set the tension correctly at the beginning to avoid most other adjustments as you spin. We suggest you set the tension using the smallest whorl on the flyer. Increase the tension to the point that slippage ceases and you have positive drive. Normally you can hear when a drive band slips (more likely to occur on the down stroke of the treadle), so just increase till the sound goes away. Now, when you need a slower speed, just change the band to a larger whorl and most likely you will not need to make any adjustment to the tension setting. Question: Why is it harder to treadle when I change to a smaller whorl? 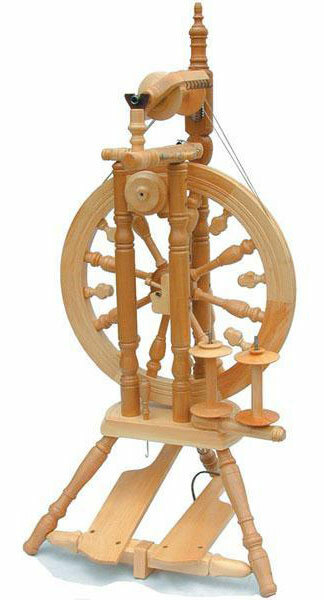 One generally changes whorls on a spinning wheel in order to achieve a desired output speed at the flyer while maintaining a given comfortable treadling rate. The rate of treadling (cadence) is kept fairly constant, but different foot forces are required when using different size whorls. In particular, it generally takes twice the force to treadle smoothly when using a whorl that is half the diameter of a larger whorl (law of energy conservation). 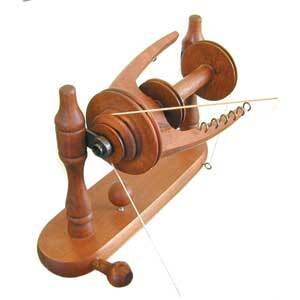 This does not mean it is difficult to treadle with a small whorl, only that you will most likely feel a difference. This is normal. There are several reasons why it takes more force to treadle when using a small whorl, but the primary cause is something inherent to all transmissions: it takes more energy to make something spin faster. It requires more work (energy) to put additional twist into yarn from a spinning flyer. This is the "feel" you have as you treadle. There are two fundamental ways to make the flyer spin at a higher speed. The first way is to use the same foot force and simply treadle faster. This works, but is not a good idea since the high cadence quickly becomes uncomfortable. Ideally you want a regular, comfortable cadence for all speeds and allow the mechanics of the wheel (ratios from different whorl sizes) to create different flyer speeds for you. This brings us to the best way to increase speed. 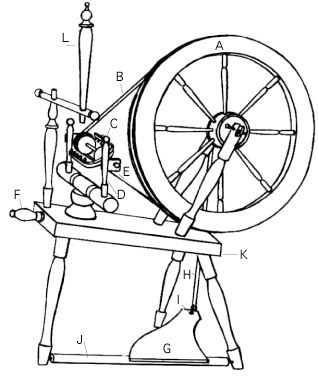 This second (and best) method for achieving a higher speed is to change the transmission ratio by using a smaller whorl at the flyer (this is how all treadle wheels work). This allows one to maintain the same comfortable cadence, but does requires greater foot force in order to produce the required energy to rotate the flyer at a higher speed. A secondary cause of higher treadling forces when using smaller whorls is friction. When one changes to a smaller whorl, it is generally necessary to increase the tension in the drive band. This is because the smaller whorl has less surface area along which the drive band must maintain traction in order to not slip. To regain a sufficient traction force, the drive band tension must be increased. It is this greater tension that results in higher friction at the bearing surfaces that support the flyer. To compensate for these friction losses, one must treadle slightly harder. Using elastic drive bands (generally not recommended for double drive wheels (but some elastic bands do work well on double drive wheels provided the specifications of the band is optimized), but see hybrid note in previous section), instead of string, can help mitigate this problem because the rubbery surface doesn't slip as easily, therefore requiring less friction-inducing tension in the band. There are, of course, other reasons for this force question (dynamic, inertial, and friction effects due to the fact that the wheel - and therefore the flyer as well - is not always rotating at a constant speed) but we can ignore these for this discussion. How about foot placement on the treadle? - yes, this can be important as it can greatly affect the "feel" of the wheel. You want to have your foot (feet) in the most advantageous location that results in comfort for you, ease of treadling and, with some wheels, the ability to not only use your toes but also your heel(s) to generate "force." Place the foot too far one way or the other and negative factors develop. Good foot placement is greatly helped by your being positioned correctly at the wheel and sitting at the proper height. This will be determined by your physical size and the design of the wheel. Once you "discover" the best location on the treadle(s), you will recognize the feel and will, almost automatically, place your foot/feet there each time you address your wheel. Tip: take your shoes off. You will feel the forces at work better and you can move your feet to optimize your work. Each manufacturer makes his own bobbins and for the most part bobbins are not interchangeable with wheels made by others or with antique wheels. In fact, a single manufacturer may make several different bobbin styles based on different wheel designs, flyer designs, single and double drive and finish. How much yarn a bobbin will hold is a question that comes up regularly and the answer may be one of many considerations when selecting a wheel. If the question is in terms of yarn weight, then the answer has to be general because of the variability of winding yarn on a bobbin. Depending on how tight it is wound and the type of yarn being spun (thick, thin, lace, etc. ), one day you may get "x" amount on and the next day you will get "y." The only reasonable way to compare bobbin capacity is to calculate the volume of the bobbin available to wind on the yarn (area between both ends less the area of the bobbin core). So we have done that for you. Below is a chart showing the various bobbins by the different manufacturers we represent. If a manufacturer has several different bobbin styles/sizes, we list each, so be sure to consider just the bobbins that fit your wheel or the flyer you are using on that wheel. If you are comparing bobbins between manufacturers, be sure to compare "apple and apple." 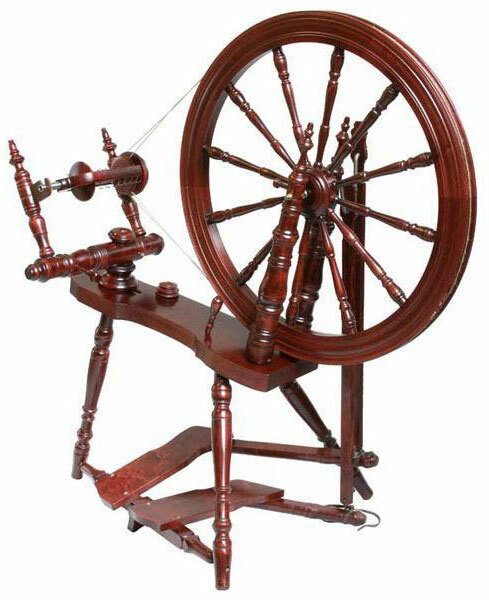 Features and options vary from one wheel to the next, but some things to consider include single or double treadle, wheel diameter, type of wood, size of orifice, size of bobbin, extra bobbins, additional speed control whorls, and distaffs. Accessories include hand cards, combs, hackles or drum carder, flick cards, niddy noddy or skeinwinder, spinning stool or spinning chair, ball winder, swift, spinning gauge, yarn balance, spinning books and spinning DVDs/videos. Appearance matters to some. Having a wheel that looks like an old style wheel or wheel that will match the character of a house or furnishings adds additional considerations. "The Ashford Book of Spinning" DVD or "Spinning Wool - Basics and Beyond” DVD.